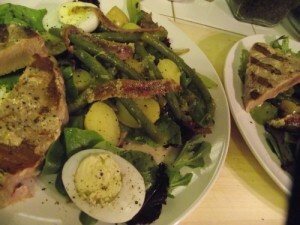 This salad takes a little bit of time with all of the prep and individually cooked components but it’s worth the time. Everything can be made ahead of time and the tuna grilled right before serving. You can use canned tuna but using ahi steaks just kicks it up a notch. Zest the lemon and dice the peels finely. Season the steaks with salt & pepper and drizzle with 1 tbsp of olive oil. Add half of the lemon zest and place the steaks in the fridge for at least an hour. Do NOT add any of the lemon juice to the steaks, use the zest only. The juice will actually cook the steaks. Grill to rare on a hot BBQ or hot pan just before serving salad. Boil the potatoes, drain, cut in half and put in a bowl. Blanch green beans until still slightly firm, drain and add to potatoes. Combine the oil, vinegars, salt, pepper, mustard, remaining lemon zest and lemon juice. Add 2/3 of dressing mixture to bowl of potatoes & beans and chill in fridge for at least one hour. Cut the boiled eggs in half. Spread the lettuce on a dinner plates and top with equal amounts of potatoes, beans, egg halves and olives. Top with anchovies fillets and drizzle with remaining dressing. Serve with fresh bread and grilled tuna steaks. Some people also add tomato slices but I don’t like them in this salad.